Until the Fitbit Ionic arrives in October, the Fitbit Blaze is the closest we've got to an actual smartwatch from the wearable giant. Inevitably comparisons were always going to be made with the Apple Watch and the Apple Watch Series 2. Whichever way you slice it, the Blaze is Fitbit's first smartwatch, even if the company flat-out refuses to call it such. It's a fitness watch, got it? And regardless of how much the company wants to avoid comparison to the Apple Watch, the truth is that people only have one wrist for tech – and for many, it will be a choice of whether to buy the Watch Series 2 or the Blaze. That's why we've compared specs and features in detail to see if the Blaze can out-muscle Apple's second generation smartwatch. The Blaze is one of Fitbit's best designed devices – but up close it's still not that much of a looker. The rugged elastomer plastic band has not entirely disappeared, but there's now a selection of different straps to give it a more smartwatch feel – if you fancy forking out. There's now a host of different finishes you can pick from, including a gun-metal version of the casing which certainly ups the style stakes. And there are now matching metal straps and even leather bands to give it a sleeker appearance. Fitbit's clearly taking an Apple-like approach to design with the option of more luxurious bands, enabling you to customise for different looks. If you want variety though there's only one winner here and that's Apple. You still get to pick from two sizes (38mm and 42mm) and there's a range of different models to choose from. You can take your pick of silver, gold, rose gold and space grey aluminium finishes, and there are also stainless steel case options and the new white ceramic model. But that's not all. Apple teamed up with Hermès for more a fashion-friendly model and it there's also the Apple Watch Nike+ edition too. Both watches have colour touchscreen displays, though they use different technologies. Apple employs OLED screen technology in two different sizes, with a Sapphire crystal glass protection for the ceramic and stainless steel models and ION-X strengthened glass for the standard model. It's also brighter than the original Watch display. Fitbit opts for an 1.6-inch LCD screen with 240 x 180 resolution and Gorilla Glass 3 coating to give it an extra layer of durability. By any metric, Apple's tech is far superior. In terms of navigation, the Blaze follows in the footsteps of the Surge, using two physical buttons on the right and one on the left. There is of course the touchscreen display as well, where you'll do the majority of your navigation, swiping left and right between modes. While the one button on the left acts as a home/back button, the two on the right act as quick shortcuts to easily pause and finish workouts. Apple totally redid Watch navigation with watchOS 3, making swiping left and right between watch faces the majority of the experience. The digital crown acts as a portal to your app launcher via click, while the side button brings up your dock of favourite or most used apps. Then there's the Force Touch-enabled screen, which lets you press a little harder to customise your watch faces. If you care about having a waterproof smartwatch, the Series 2 is your one. It's safe to take it for a dip at up to 50 metres depth, offering the same waterproofing as the Fitbit Flex 2. The Blaze will at least hold up if you get caught out in the rain. Fitness tracking is unsurprisingly the Blaze's big play here, and its list of features is a kind of refinement of the company's products to date. It'll track steps, sleep, calories, floors climbed and active time, and there's an optical heart rate sensor to deliver resting HR and active time. In terms of sensors, theres a three-axis accelerometer, gyro sensor and an altimeter to track elevation. There's no on-board GPS, so you'll have to rely on your phone's GPS to track runs and hikes via a feature called ConnectedGPS (a renamed version of the old MobileRun). You do get sleep tracking though and it's done automatically using a combination of the accelerometer to detect movement and the heart rate monitor to detect changes in your heart rate. The Blaze can also track a whole host of exercises and uses the recently introduced SmartTrack feature to automatically recognise what activities you're doing. This means you'll always get credit for exercise, whether it's that morning walk to the office or a full gym workout. The Apple Watch, on the other hand, will rarely detect your activities and register them as exercise; it's extraordinarily rare and incredibly inconsistent. The Blaze also recently inherited the Fitbit Charge 2's Cardio Fitness Levels, which means it'll automatically detect and interpret your cardio fitness, allowing you to see it improve over time and compare it to people of the same age/gender. It does look like the Apple Watch will catch up once watchOS 4 comes out, however, as it supports VO2 Max tracking. Which feature-packed tracker should you choose? You get on-screen workouts on the Blaze as well, powered by Fitstar and taking you through sessions one exercise at a time. However, it doesn't count reps or feature any difficulty progression, so it's hardly a game-changing feature. Look to Moov Now for the best offering of guided workouts. There's an abundance of third-party data support here as well, so you can feed data from the likes of Strava, Endomondo and Weight Watchers into the Fitbit companion app if you don't want to give up data from your existing health and fitness apps. For the Apple Watch, activity tracking is certainly an area that needed addressing and while there are no revolutionary changes on the Series 2, things have got a little better. Most notable is the ability to share your activity with other Watch owners, for that extra level of competitiveness to put in a few more steps or running miles. Things will get better too with watchOS 4, which supports high intensity interval training and the ability to link multiple workouts. Much like the Blaze, the Watch 2 has an accelerometer, gyro sensor and a heart rate monitor that uses flashing green LED lights to detect changes in blood volume. It's a very similar to the way Fitbit's monitor works. Unlike the Blaze, you do get built-in GPS, so you can run or cycle without your phone. Now that it's waterproof as well, you can go swimming with it and it'll record a host of useful swim metrics. While the Apple Watch does have built-in GPS, it doesn't, or can't, track your elevation. So while the GPS-less Blaze can track how many flights of stairs you climb, the Apple Watch can't. And oh, if you're into weights, the Blaze has you covered while the Apple Watch doesn't. In watchOS, you'll have to enter weight lifting into the nebulous "other" workout option. Apple's Activity app is the focal point for activity tracking, providing a snapshot of your day and giving you a nudge when you're lagging behind the trio of targets for calories, active minutes and standing time. A step count is available on the wrist, but the rest are worked out automatically, and will be downgraded if you repeatedly fail to hit your target. At the moment, there's no sleep tracking, and there's no word about it in watchOS 4, so here's hoping it's in watchOS 5 or Series 3. Meanwhile, the Blaze's recent software update has added Sleep Stages, allowing you to see how long you spend in light, deep and REM sleep via the companion app. Oh, watchOS 3 also introduced the Breathe app. Apple's first stab at mindfulness, this prompts you to take time out for some guided breathing activities. Superb, if you like that sort of thing. The Blaze, on the other hand, has Relax guided breathing. While Relax allows you to do either a two-minute or five-minute breathing session, the Apple Watch's one-minute session features more nuanced vibrations that can better guide you through breathing without having to look at the device. Plus, the Apple Watch has the edge on mindfulness with third-party support. There's a pretty comprehensive collection of fitness apps that are optimised for the Apple Watch, which means if you already use Strava, Nike, RunKeeper or the like, you'll be able to continue on the Apple Watch. However, while there are plenty of apps, none bring much new to the table. Clearly, the Fitbit ecosystem is better geared towards fitness tracking. While Apple's app is decent, the lack of insights into health trends, resting heart rate data and proper workout recording means it still can't hold a candle to the Fitbit. The Series 2 does have that GPS on board and swim tracking skills in its favour, which should appeal to users who want a bit more from their fitness-focused wearable. Smartwatches are billed as smartphone companions, and that basically means reducing the need to dip into your pocket for your phone to check a text, read an email or you know, take a call. Apple certainly does a better job of this than Fitbit at present. With the Blaze, you'll be able to do things like reject or accept calls, receive notifications from emails and texts, and control music playback. A recent update to the companion app has brought third-party notification support to the party, so things are improving on this front. With the Apple Watch, you get all the notifications you could want, including third-party apps, plus you get the bite-sized bits of real time information from your favourite apps – and perhaps even more importantly, you can control which notifications you see. To complete a barnstorming smartwatch performance there's music playback control, and on-board storage to download music from iTunes/Apple Music for offline playback. You can also answer calls from Apple's smartwatch and use Siri to add appointments to your calendar, set an egg timer or finding out whether Sean Astin was definitely in the Goonies. (Yes, he was). 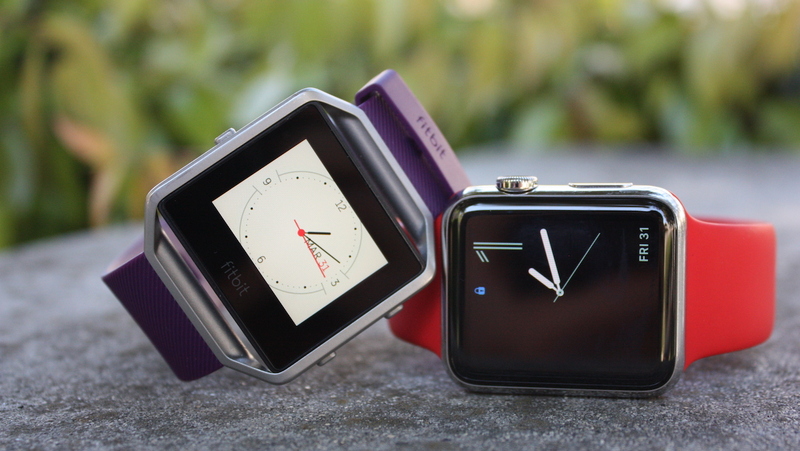 This is one of the biggest debates surrounding smartwatches right now. How much battery life is enough? If you want lots of staying power, there's only one winner here and that's the Fitbit Blaze. The Apple Watch Series 2 can now deliver two days, whether you go for the 38mm or the 44mm model. The latter has a bigger battery, but don't expect to get much more play time than the smaller version. The Blaze promises five days, and that was reflected in our testing, which included a number of workout sessions. That will of course depend on which features you use on a regular basis and whether you decide to crank up the screen brightness to the max. Without power-sapping features like GPS onboard, the Blaze's stamina is not too shabby. The Fitbit Blaze comes in at $149.95. If you want the Watch Series 2, you'll need to part with at the very least $369 but that can sky rocket up to anywhere near $1,499 when you start considering the Ceramic or Hermès editions of the Apple smartwatch. That's a pretty clear difference in terms of price. Fitbit's new design is a welcome change, and for fitness fans who desire a watch-style design, it is in many ways a winner. It brings together a decent array of fitness metrics (thanks to the recent update), and is one of Fitbit's best looking devices. But the richness of the Apple Watch Series 2's features is hard to beat. Third-party app support, the array of cheap strap customisations, and a penchant for notifications makes it more than just a fitness device, and that's something you really need to think about when choosing between the two. This review is comparing apples (no pun intended) against oranges. The Blaze is a fitness tracker with some smart watch features), but the Apple Watch is a smart watch. Two different types of products.